The Lotto Zhero Gravity Ultra is a very unique soccer cleat. 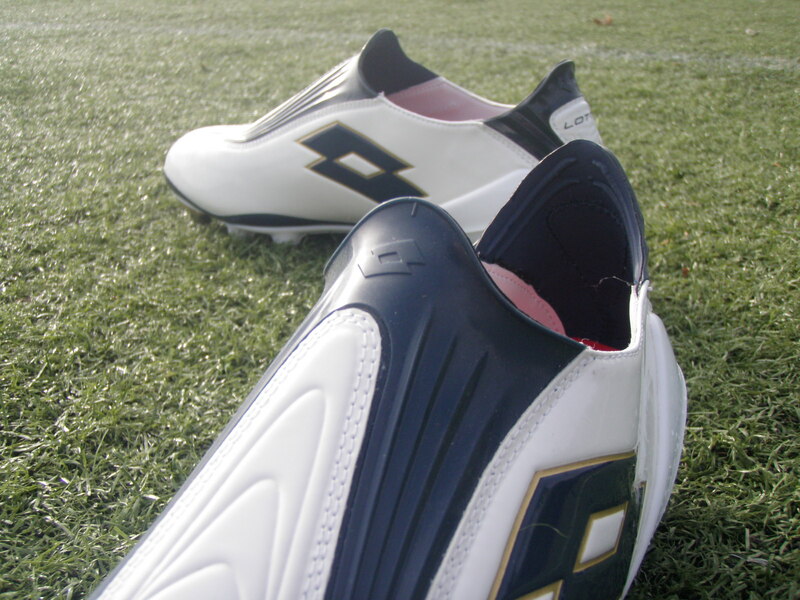 In fact, the Lotto Zhero range is the first line of laceless soccer cleats to be released by a big company. To create something in this design takes a lot of research and development, and you have to know that end product offers the right balance for soccer players. My initial concern at the beginning of testing was comfort, and how these were going to fit to my feet. The concept of a laceless cleat is very appealing, but in reality there are challenges in perfecting the comfort and performance. Before reading this review, I think it is important to note that these cleats will fit different for each player. I wore a size US9 in Bright White/Metal Blue for testing, the latest colorway on the market comes in a Blue Aster. Find pairs of Lotto Zhero Gravity Ultra. 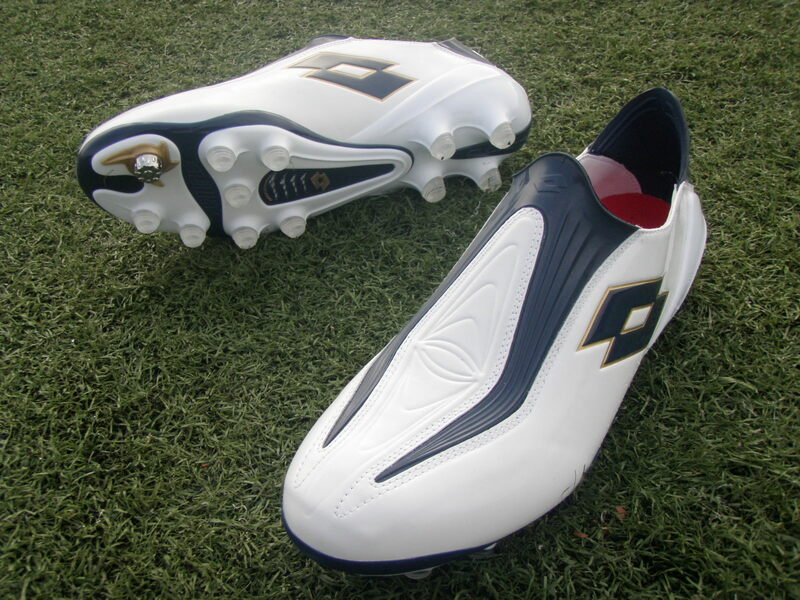 I can start off by telling you that these are a really sweet looking boot. Lotto use a great color pattern that draws your attention, with navy and gold detailing on a primary white. The white also has a reflective look to it when in sunlight, kind of like a rippling water effect that runs across the entire boot. The laceless design is obviously very unique and something that draws a lot of attention. I can tell you that most of my teammates were eager to check them out when I put them on for the first training session. 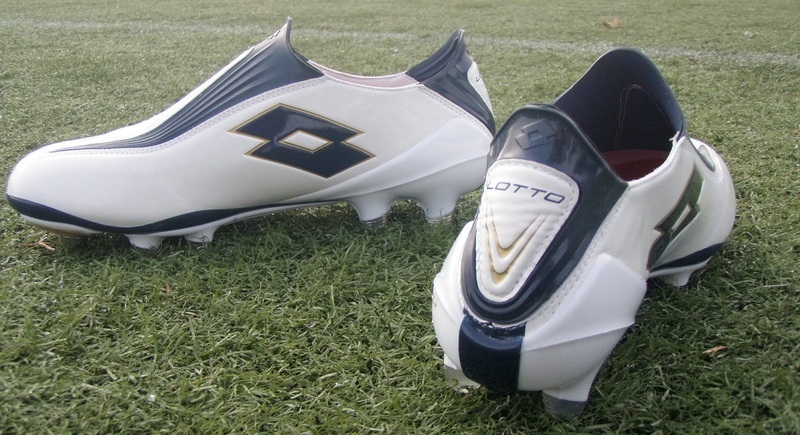 Lotto use a rubber type compound in place of the laces and also on the heel of the boot. There is some elasticity in this compound, allowing you a little flexibility when getting your foot in and out of the boot. Along the front of the cleat is a symmetrical design that actually serves an important purpose. The center of the design folds slightly, giving you the best fit along the forefront of your foot. All in all, I would say that the style and design of these is top class! Next up with any boot is breaking them in slowly. I took these through 2 early morning jogging sessions with no problems before deciding to break them out for a proper training. But that is where things started to get a little iffy. First off, the soles of my feet started cramping. This is probably related to the shape of my feet compared to the boot, and does not mean it will happen to every player. But what it does signal for me is the fact that they take a little longer than other boots to mold to your feet. After 2 or 3 more training sessions they started to feel a little more comfortable, but having said that I had the boots for a good 2-3 weeks before deciding to use them in a game. Overall, I found them to be difficult to break in. Next problem is the fit. It was quiet evident that these were not going to work for me when they started making a squelching noise on every step that I took while wearing them. Lotto have done a lot of work to create a fit that matches several foot types, but I don’t feel like they have covered (or even can) all bases. My primary problem was that they never felt tight enough around the opening and I continually felt like I needed laces to tighten them up. Length wise, they fit my feet pretty well, so I don’t think going down a full size would have been the answer. In saying that, I would be interested to see what difference a half a size would have made. 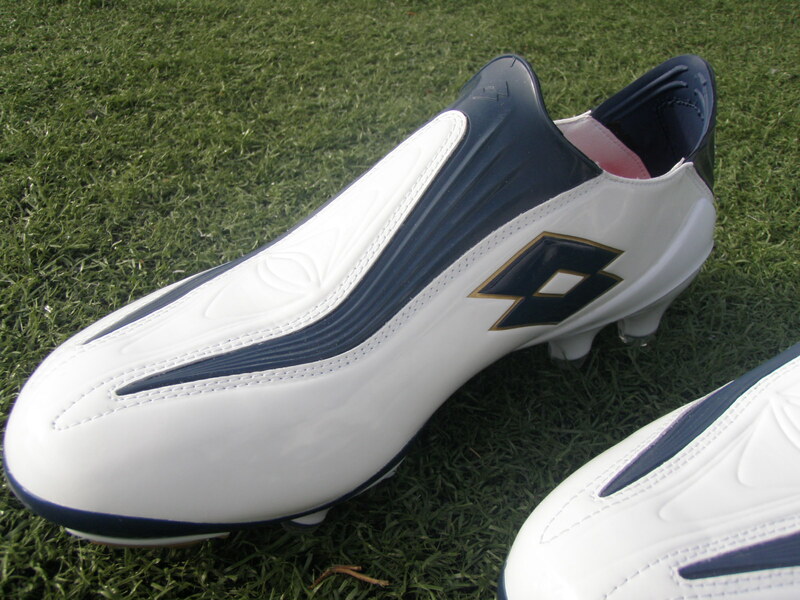 The laceless design is obviously the most noticeable advancements on this cleat, but there are also other developed technologies that Lotto use on this boot. 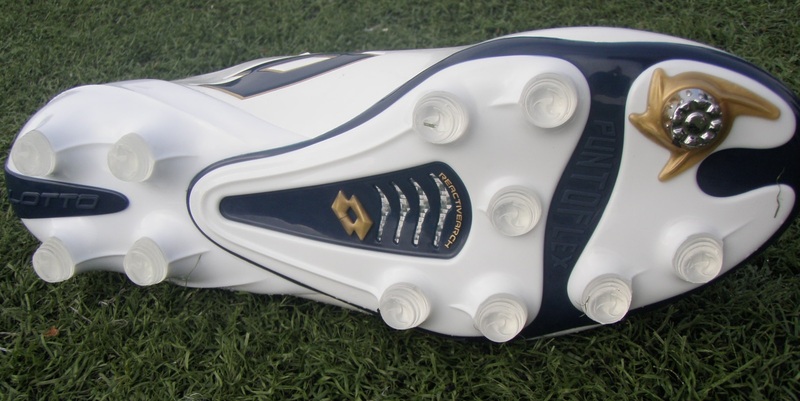 If you turn the boot over you will notice the use of Lotto’s patented Twist n’Go stud at the front of the cleat. The idea of Twist n’Go is to enhance turning speed and acceleration when you look to turn. The stud basically rotates 360 degrees, so as you turn the stud turns with you. Is it noticeable? I will say the same thing that I did when testing the Lotto Zhero Evolution, it is all down to the player wearing them. For me, it had more of a psychological effect than anything else and I never noticed its effect in-game. Realistically, it is difficult to imagine one rotating stud providing a great deal of performance benefits. Next up is the reactive arch (Lotto advertise by printing it on several areas of the cleat) that has been designed to essentially move more dynamically with your foot. The effect is more cushioning and protection on impact while running. As discussed in the comfort and fit section, you really have to be sure that you want these. I can imagine that getting the right fit is going to be an issue for many players. Weight wise, these run around 9.4oz, which isn’t bad, yet I feel that Lotto could trim that down to really ensure they fit in the speed bracket. One other issue I had was scuffing, and these boots will easily scuff. In order to avoid this and to add life to the boots you will have to keep them clean after each time you wear them. If you buy these, you are going to be extremely pleased when they arrive at your door. Lotto have put together a great looking boot that comes with 2 additional inserts, a shoe horn to help you get your feet in and a small carry bag. They also have shape inserts in them when they arrive, making them seem classy. But my advice revolves around the issue of being sure that these are the boots that you want. Granted Lotto have brought the price of these down to $200, but it still a lot of money to invest and these won’t suit every player. nice. 🙂 i imagine the shoe flying when kicking, apparently the laceless system works. off topic: could you cover some mizunos too? I am still waiting for someone to review Mizuno knuckle shots vs no mizuno knuckle shots and mizuno knuckle shots vs predator/laser spin shots, but unfortunately you need someone with these shoes and with knuckle shot ability. Do you want to know more?? I ordered these cleats, and was very happy when I unboxed them. Unfortunately when I ordered my normal size, they were a half- to full-size too large. My advice for anyone buying these is to definitely order a size down. I've been looking all over the web but haven't found any information on how the Twist n’Go technology performs on artificial surfaces. More parks are installing these types of fields and I'm wondering what happens when the aluminum tries to dig into the field. Thanks. I wore these on artificial and they were fine. It acts just like a regular stud, so it doesn't get stuck in the surface. Although it won't dig in like it will on a natural surface, it still has a purpose on the artificial. would these be a good buy for $50? They retail for $220. So if you want to give them a go, it would be worth it. Does soccer.com provide the boots for you or do you purchase them yourself?? Tolle Hauswasserwerke günstig zu kaufen! Nur bei uns!